Although not originally in my plans, it was a terrible temptation not to come here and let the occasion go. After all, what other occasion I will see to reach Buffalo? Perhaps no other than returning to the Niagara Falls in the American side then. So as the plan developed when I was researching information about the Niagara Falls, it turned to our luck that during the Christmas season they do a show of lights projections in the falls, visible anyway when at dusk. So what to do the rest of the day after visiting the falls in the morning and waiting for the night to come? Buffalo seemed to be the right choice. At only 35 kilometres from the falls, and although considering the border crossing since we came from Canada side, it was way, way worth it. The very good side around this region are distances. We were barely 170 kilometres from our base, Toronto. And even the border to cross into the USA took little over 15 minutes altogether! Returning into Canada took around 5. Now, Buffalo you might ask, why? Well, believe it or not this is one of the cities long time in my wish list. There are more such cities I wish to visit in the USA alone, for example Detroit, Pittsburgh, Cleveland, Baltimore, Portland… I am heavily in love with industrial architecture and everything to do with the art-deco style and movement. 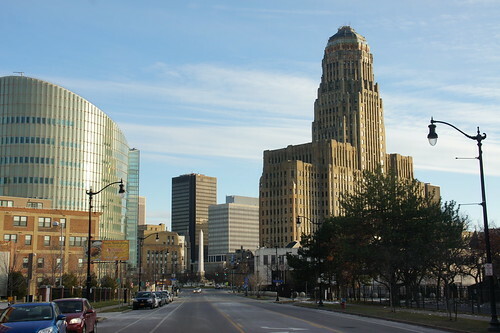 Some of these cities are simply unique jewels on this, with Buffalo no exception. Further to this, if you see its perfect urban plan, legacy from the early 1800’s where avenues and wide tree-lined streets radiate and meet at grand squares and a grid system branching out from downtown, you immediately appreciate a city with a great taste for design. This is the work of Joseph Ellicott, the same architect of Washington D.C. The only difference between one with another are the buildings. While in the nation’s capital these are grand neo-classical structures, generally low-rise; Buffalo was the playground of architectural styles being the most imposing the art-deco. A relatively “new” city where its proper street layout dates from 1804, vastly developed since the completion in 1825 of the Erie Canal with the consequent surge in population and commerce. Its harbor expanded continuously and by 1843, the world’s first steam-powered grain elevator was constructed by local merchant Joseph Dart and engineer Robert Dunbar, speeding the loading/unloading and doubling capacity. The birthplace of the modern grain elevator. Nowadays such industrial past means the city has the world’s largest number of extant examples, many of which of historical value clustered along what’s known as the “Elevator Alley,” a narrow stretch of the Buffalo River adjacent to the harbor running under Ohio Street and along Childs Street. Starting the 20th century, the city got hidro-electric power produced at the nearby Niagara River, becoming one of the first to be completely light up on electric power, hence its nickname “the City of Light”. It continued to further develop and grow because of its heavy industry, until the big depression and decline from the 1950’s. Factories closing, jobless raising, poverty and crime becoming a stronger problem. It was not until the 2000’s when the city’s potential was rediscovered, and slowly transformed into a small service orientated city. Redevelopment happened everywhere in the city, restoration projects and a broad care all over the public spaces. What you see in Buffalo today is actually an immaculate spotless clean and quite perfect city, full of history and rich in architecture. When talking about food, we have to write what the National Geographic Society says about Buffalo: The World’s Top Ten Food Cities. And they are right, even though our overall experience in the city was reduced to only some hours to enjoy. It is a huge mix and blend influence of Italian, Irish, Jewish, German, Polish, African-American, Greek, and American. Think of anything, boom, you have it, but among the big list, two stand out among the others: Buffalo’s pizza. A blend between the traditional New York style (thin crust) and the Chicago style (deep-dish); delicious everywhere. And of course, we cannot leave the city without talking, and trying, the famous Buffalo Wings. Well, that’s the name that brought it into fame for what’s spicy chicken wings known elsewhere. It was 1964 at the Anchor Bar where Teressa Bellissimo prepared them for the very first time in the world and spread through the world. Located in 1047 Main Street, this is just north from the Theatre District. It is a fun restaurant I strongly recommend you and not only for its history, but the great food served there; located north of downtown at the intersection of Main and North Streets. For more information about Buffalo check Wikipedia and Wikitravel sites. The USA’s currency is the American Dollar ($, USD). Please note that any price reference is true as from when this guide was created, therefore check prices in advance as with the time they change. Buffalo and Erie County Naval & Military Park Located on Canalside by the Erie Lake, at the original end point of the Erie Canal, is home to several decommissioned US Naval vessels among its great collections. It is also the southernmost point and good starting place for touring the city as from here, everything is northeast along Main Street and parallel ones. Erie Canal Harbor Central Wharf Next to the Naval Museum, recently redeveloped into a nice boardwalk along the waterfront, retaining some old industrial structures such as swing bridges of the original end point of Erie Canal. Main Street runs along the eastern side all the way northeast through the entire downtown. Erie Canal Harbor Station of the light rail serves as the southern terminus. Edward M. Cotter The world’s oldest active fireboat. Originally built in 1900 for the Buffalo Fire Department. She can be seen by the harbor, by Ohio Street. If you continue ahead along the riverside on South Park Avenue, passing the light rail depot, then you come to the dock. Listed a National Historic Landmark of the United States. Main Street and Church Street One of a series of avenues perfectly planned creating the famous urban structure designed by Joseph Ellicott of grand squares and orthogonal grid street system. Many of the major sights are long this street, and the light rail serves it all along free of charge until it becomes underground after Theatre District. -One Seneca Center Built in 1970, it is still the tallest commercial building in New York State outside of New York City. Its architects, the back then very young world-class firm Skidmore, Owings & Merrill, designed in brutallist style. -Coca Cola Field Built in 1988 it is since then home to the Buffalo Bisons of the International Baseball League. As a tip, if you go to the parking lot at the back, you will get the view of the field inside and the skyline behind. -Ellicott Square Building At the time of construction, 1896, was the largest office building in the world until 1908. In Italian Renaissance style, it contains a 23 million piece marble mosaic floor in the grand hall. -St Paul’s Cathedral The next building west and ahead of the Ellicott, impossible to miss, built between 1851 and 1870. -Main Place Tower Designed by Harrison & Abramovitz was completed in 1969, in the time of the city’s revival after years of depression since de-industrialization. -One M&T Plaza Opposite from Main Place dating from 1966, recalls its importance in its architect, Minoru Yamasaki, the same who designed the now gone Twin Towers of NYC, among other genius buildings still extant in the world. -ECC’s City Campus Building The former Federal Post Office, located east of the Ellicott Building in the same square, is one of the finest Gothic revival building in the city, now home to the classrooms and offices of the ECC College. -Prudential Building Originally known as the Guaranty Building, is the creation of architect Louis Sullivan, whose belief was “form follows function”. It’s located behind the St Paul’s Cathedral, in Church Street. -Old City Hall Also on Church Street, visible from nearby Prudential Building, was constructed in 1875 as the home of the City Hall and Council until the 1920’s when with a 4 times more the population in the city since the building’s construction, was decided the need for a new building. -St Joseph’s Cathedral Consecrated in 1855, built in Gothic Revival style in a reminiscent of the character of the 13th century Salisbury Cathedral in England. Almost by the corner of Church with Franklin Streets, near Old City Hall. Delaware Avenue Three streets west from Main, is the second avenue crossing the city in importance, especially towards its southern terminus for containing the sight number one in Buffalo, the Niagara Square. -Buffalo City Court Building Built in 1974 is the greatest example of brutalist architecture in the city. Easy to spot in the square, the concrete building at the south side of the square. -City Hall Along the west side of the square, completed in 1931 in Niagara Square, it is the largest of any art-deco buildings in the city, and when considering the city’s size, it’s hard to believe this gigantic size of a city hall. No need to mention it is one of the major sights in downtown. It’s simply spectacular on every detail, and if you can, enter the lobby to admire the William de Leftwich Dodge mural. -Federal Court Building At the north side of the square, a new glass structure from 2011. -Former Statler Hotel Also by the north side of the square, constructed in 1923 as one of the finest hotels in the city in early art-deco style so traditional in the USA. It had too many more rooms than the city could accommodate hence why it slowly turned into offices yet retained the ballrooms and public spaces in the lower floors. -Memorial Federal Courthouse Along the east side of the square, aligning with Court St. that heads back towards Main Street. In art-deco style. -McKinley Monument In the centre of the square, a memorial obelisk dedicated to the memory of William McKinley, the 25th President of the United States, who was assassinated on September 6th, 1901 while visiting the Pan-American Exposition in Buffalo. Main Street and Lafayette Reaching back Main along Court Street, this is a great corner with some further important architecture. -The Liberty Building Built in 1925 as one of the rarest examples of neo-classical style in the city considering it was the beginning or the art-deco. Notice at both tower tops identical smaller replicas of the NYC’s Statue of Liberty. -Lafayette Square A very nice landscaped with great views towards some of the city’s finest buildings around it. It the middle is the monument to the Soldiers and Sailors who lost the lives in 1884 in the “war to maintain the Union for the cause of their country and of mankind”. -Brisbane Building Aligning the south side of the square was built in 1894. Still retaining most of the original shape, however losing great features as the main middle entrance in classical style. -The Rand Building At the north side of the square, one of the tallest and finest art-deco structures from the golden era of Buffalo. It is believed that this building influenced the design of NYC’s Empire State. Main Street and East Huron The next intersection of Main, just a station ahead in the light rail, or very short walk from Lafayette. -Buffalo Savings Bank One of the rare examples of beaux-arts style building in Buffalo, yet one of the grandest without any doubt, with its characteristic golden cupola, representing power for what once was one of the most powerful banks in America. Nowadays a branch of the M&T Bank. -Electric Tower The second beaux-arts iconic masterpiece in the city. While the bank is horizontal, this is in height. Its model was based on the 1901 Electric Tower which was the centrepiece of the Pan-American Exhibition of that year. Theatre District Continuing north along Main Street, home to the arts and entertainment ares in the city. -Market Arcade Dating from 1892 as a public multiple businesses shopping space. The only covered market in the city. -Shea’s Performing Arts Centre Opened in 1926, the most iconic theatre in Buffalo, designed in a blend of Spanish, French Baroque and Rococo styles. It retains the original Mighty Wurlitzer, one of only 5 in the world that had tonal finishing. Central Terminal Once a wonderful art-deco jewel among the railway era, yet ever since its closure in 1979 is has stood almost abandoned, awaiting a most deserved restoration. Located 4km east from downtown, the best way to reach would be if you have a car, otherwise bus number 23 to Fillmore Ave. & Paderewski Dr., which is on a rather isolated and impoverished area. Public Parks System Originally designed by Frederick Law Olmsted and Calvert Vaux between 1868 and 1896, it is the oldest and finest coordinated system of such recreational spaces in the country. You will eventually come across any of the parks as you tour the city. Elevator Alley Farther down the Buffalo River, this is the only city in the world retaining such amount of grain elevators. While many became almost derelict, efforts were taken to preserve these and it’s a sight on their own, especially for the industrial architecture lovers. A great view is at the Ohio Street Bridge, and another the corner of South with Hamburg Streets. Buffalo Niagara International Airport is the main gateway into the city, and most important airport after all these serving New York City. Nearby airports one can benefit to reach Buffalo are Niagara Falls, and across the border in Canada, Toronto. From the airport the best, most reliable and frequent public transport to the city centre is the NFTA Metro Bus number 24B. Leaving the arrivals terminal towards Buffalo Exchange Street Amtrak station. International rail and bus links Toronto with New York City via Buffalo and other important cities along the way. Although a lengthily journey bearing the distance is not really that much, it is also costly compared with flying instead. Still, a great option for seeing the landscape, and the way more relaxing and chill that is the train. Within the city, most of the sights are within easy reach from each others on foot. From the shores of Lake Erie, crossing downtown towards the north, passing Niagara Square and beyond towards the University. It’s easy to navigate as its a perfect grid of avenues and streets. Buses do cover the entire city and beyond, and a single light rail line links Lake Erie with the University. Good news in here! The entire section downtown which runs at street level (it’s a tram) is free of charge! You will need to pay only in the section that runs underground from downtown towards the University. A single fare, no matter how long you travel on a bus or on the underground section of the light rail costs 2.00$, and should you need to change between buses, or from bus to tram or vice-versa, you need to pay again the fare. It’s great news in the other hand to know that you can go all the way to Niagara Falls for just 2.00$! The buses NFTA Metro Bus number 40 and the 60 will take you there. Since we did not stay overnight in the city as our journey was a day trip from Toronto, our base, to Niagara Falls and Buffalo, there is not much I can say about this subject bearing that as usual, a good and reasonable point to start your search is by checking some of our preferred affiliate hotel search engine such as Hotels.com, Booking.com, Expedia, Otel.com, Agoda, Opodo, LateRooms or Ebookers. This entry was posted in 04. North America, 05. December, 2017, Big Trips, USA and tagged Buffalo, North America, United States of America, USA. Bookmark the permalink. After I’ve found out that you are very interested in travelling to Iran, I went through your instagram and your website which was very interesting for me, and I understood you are a world traveler with your friend Christof who tries to find the best deals while enjoying your time seeing world’s wonderful places. As you said through your comment and also your travel map on your website, I know that you didn’t travel to Iran yet. There are few places in the world which have a history and culture as rich as Iran and also famously-welcoming local people. I think after your visit in the USA, it is the best time and season to come to Iran and enjoy one of the most amazing time in your life. We can also help you to find the best deals here in Iran. Don’t forget to visit our website! Thanks so much for your kind comments. Your website is amazing and full of information like nowhere else together in the same place. Indeed I am truly fascinated with visiting Iran soon, one of my dreams and most desired travel destination. It’s been delayed and postponed due to time limitations and holiday arrangements not fitting to the right time of year to visit, however if not this it will happen the next year, right in coincidence to accomplish visiting 100 countries at the age of 35. It is for great desire and historical reasons that I would love to have Iran in such precious personal achievement. Without any doubt we will be in touch! Once again thanks and keep enchanting everyone of us through your marvelous Instagram account.